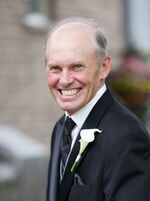 Murray Houston Obituary - Seaforth, Ontario | McGlynn Family Funeral Home Ltd.
"So sorry to hear of Murray's passing. It has been many years since we both playe"
"We’re very sorry for your loss. " It is with heavy hearts and fond memories that we announce the passing of Murray Rae Houston on Saturday, July 7, 2018, in his 63rd year. Murray is now resting peacefully with his late wife Maxine. Murray lived an ordinary life, not much different than other farmers of his generation. He was a farmer who worked hard, a husband who loved his wife, a father who loved his children, a grandpa who loved to play and a neighbour who lent a hand. Beloved husband of the late Maxine Houston (née Watts) for 37 years. Loving father of Jillian & Chris Csöff and Darryl & Jodi Houston. Cherished grandpa of Eli and Emmett. Dear son of the late Rae & Lois Houston. Loved brother of Bob & Linda Houston, the late Brenda & Dennis Mathers, Glenna Houston and Janice & Gord Carnochan. Son-in-law of Barbara Watts & the late Max Watts. Brother-in-law of Stephanie & Murray Kellington, David & the late Chris Watts, Darrin Watts, Trina & Brad McBride and Ruth Ann & Kim Schroeder. Nephew of Stephen & Judy Watts and Jean MacKinnon. Loving uncle to his many nieces and nephews. Cremation has taken place and a private graveside service will be held. A public memorial visitation to celebrate Murray’s life will be held at the Brussels Community Centre, 800 Sports Drive, Brussels, on Saturday, July 14, 2018, from 1 – 4 p.m. Funeral arrangements are entrusted to McGlynn Family Funeral Home, Seaforth, 519-527-1390.